Finely crush the Chocolate Biscuits. You can use a food processor or the end of a rolling pin. Roughly crush 1 cup of Maltesers. In a small saucepan over a low heat, melt the butter and condensed milk, stirring until combined. Add the roughly crushed Maltesers and Mars Bars to the crushed biscuits and stir through. Then add the melted butter and condensed milk and stir until combined – it will be very sticky! Pour the mixture into the tin and flatten with the back of a metal spoon. Pop it in the fridge for at least an hour until it has completely cooled. Melt the chocolate and add 1 teaspoon of oil to the melted mixture, making sure you stir it in. 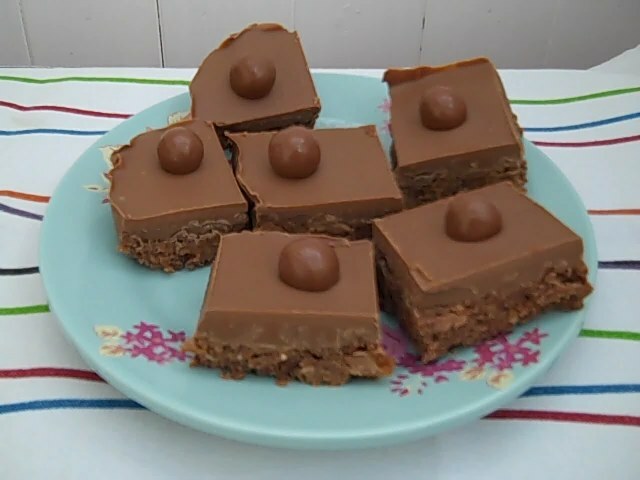 Pour the melted chocolate over the cooled slice and then decorate with remaining Maltesers. Put the slice back into the fridge to set completely. The 25cm x 16cm tin size made 15 slices.